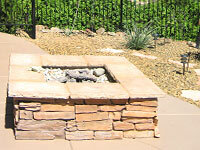 There are countless ways to enhance your outdoor living area in our high-desert climate. Jeff's Landscaping & Yard Service can build everything from outdoor kitchens, water features, gardens, fireplaces and patios. Our designer can also help you generate ideas for how to deal with your problem spots. What could be more enjoyable than an afternoon or evening spent in your backyard oasis? We are knowledgeable and experienced in design through installation of the outdoor ideas you bring to us. We can design a intimate outdoor room suitable for two or construct a complete outdoor kitchen that will accommodate large parties. We take pride in choosing the best materials for the job and going beyond the quality and performance of local workmanship codes. 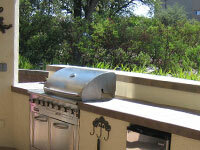 Complete Design and Installation for all of your Outdoor Living Needs. Tell us all about your landscaping needs. Call Jeff's Landscaping & Yard Service toll-free at (877) 820-0863 or Request a Quote directly from our website. We stand behind our work-- during, and after project is completed. If concerns or questions arise, we are always there to work with our client to solve them in a timely and satisfying manner for all.